So You Still Haven’t Even Tried to Make a Podcast? Remember the golden age of radio? Me, neither. Today we live in a world that knows how to podcast: that is to say, we no longer sit around the radio and wait for the news and entertainment to come to us. Armed with iPods, Zunes, MP3 players and other ridiculously-titled gadgetry, we can download and listen to this form of “Internet radio” any time we choose. If you’re not podcasting, let me be the first to welcome you to the 21st Century. As a blog/website owner, it’s your duty to provide valuable content to the target audience you’ve chosen. To deliver that content, you’ve got to learn how to use every medium possible, which means sooner or later you’re probably going to want to know how to podcast. That’s what this series, So You Still Haven’t Made a Podcast? is going to address. Even if you have zero podcasting experience whatsoever, these articles will take you from dud to stud so you can get busy clogging those airwaves. What Kind of Podcast Will You Publish? Before we get to the nuts-and-bolts of how to podcast itself, we’ll have to address some thematic-level concepts. Whether you have the technology or not, you probably won’t stick with this podcasting thing unless you’ve got some plans in place. Looking at these options, what kind of podcast suits your blog? A weekly topical podcast that keeps current with trends, or a monthly “feature” podcast that runs longer and contains additional sources like interviews? Most importantly, keep asking yourself this question: how can you give more value to your audience? It’s one thing to want to podcast, but it’s another to podcast for the right reasons. If you like your blog but feel your voice could use an additional medium, podcasting might be the exact thing for you. If you’re just thinking about podcasting because most people podcast, you might want to ask yourself if it can really add a lot to the overall content of your site. You’ll also want to separate yourself from the crowd. There are a lot of podcasts out there, so what will make your stand out? What kind of successful podcasts do you want to model? To build a successful podcast, try to imagine what you’d want a Wikipedia article about your podcast would say. What kind of “weekly features” would it have? What kind of people would you try to interview? What kind of sound effects and music can add to the podcast? What’s funny to you? How long will your podcast typically run? While you produce a podcast that’s built on providing your audience with new value, you also don’t want to lose touch with your voice. Remember to focus on what entertains and motivates you, or else what you’re doing will come across as stale and inauthentic. 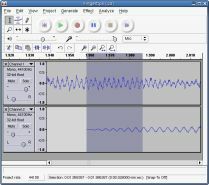 Audacity: Free recording and editing software. Wanna know how to podcast? Audacity will handle most of it. Audacity is great, and it’s what I use in my own podcasts. It’s fairly simple to use, but if you can’t figure anything out, it’s popular enough that you can YouTube your problem and reasonably expect a YouTube nerd to solve it. Later on we’ll address some common Audacity problems (like being able to export your sound files into an .mp3 file), but for now just download it and set it aside in your folder named “Podcasts.” You’ve already made a folder, right? A good computer microphone. The key here is not to skimp out and buy a cheap one. Believe me: I’ve tried it, and while they will record your voice, there’s a chance it won’t be clear or could even producing a constant buzzing sound. How expensive is a “good” microphone? Probably around $20-50, including shipping and handling. I personally use a Logitech USB Microphone, and if you use a USB microphone, you’ll have to change your settings in Audacity. A RSS feed. Integrating your podcast with your feed will do you a lot of good, particularly as good RSS feeds will be able to take a sound file you post and weave it into the feed itself. I was amazed when I started podcasting and saw that my RSS feed automatically put my podcast MP3 file into a simply “click to play” button, no work required. If you have a blog but don’t have a feed, remind me to slap the back of your head. Once you’ve gathered the right materials, you might notice the pieces of your podcast are already falling into place. Feel free to tinker around with Audacity to get a feel for how it works. In the next article in this series, we’ll learn the basics of recording a podcasting file that is fit to publish, as well as address some common errors people run into. We’ll also talk about some other ways you can add content to your podcast, including interviewing guests and adding sound effects and music. Stay tuned for Part 2! If you read the first post in this mini-series – the similarly-titled Part I – then you’re aware of some of the basic questions and answers involved in publishing your own podcast. 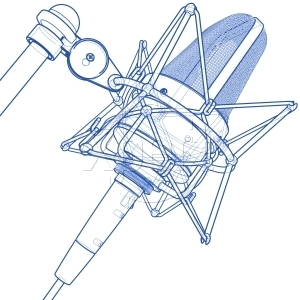 You know about software like Audacity, you’ve ordered your high-quality computer microphone, and most importantly you know exactly why you want to podcast in the first place. Good. As they say on the first mile of a marathon, it’s a start. In this post, we’re going to get into the nuts and bolts of getting a podcast from inside your head and vibrating in your voicebox and into the language of .MP3 files. Even if you’re not an expert at this, don’t worry; it will only take a little research (you’re doing it right now, after all) and some common sense. Enough talk. Let’s get started. You’ve Got the Ware (Both Hard and Soft): Now “Ware” Do You Go From Here? If you followed the instructions of Part I, you should now have Audacity installed on your computer, a computer microphone in your possession, and the desire to take the next step. Let’s explain it backwards: it’s time to learn how to actually record your voice and publish it to an mp3, even if you don’t know what you’re going to record yet. Why are we doing it this way? Because if you can’t figure out the technology, all of the preparation work can feel a little futile. Install Audacity on your computer if you haven’t already. Using audacity, plug your microphone into your computer: did you decide to go with a traditional jack microphone or one with a USB port? If you have the traditional microphone, skip step three and go to step four. If you have a USB microphone, read on. 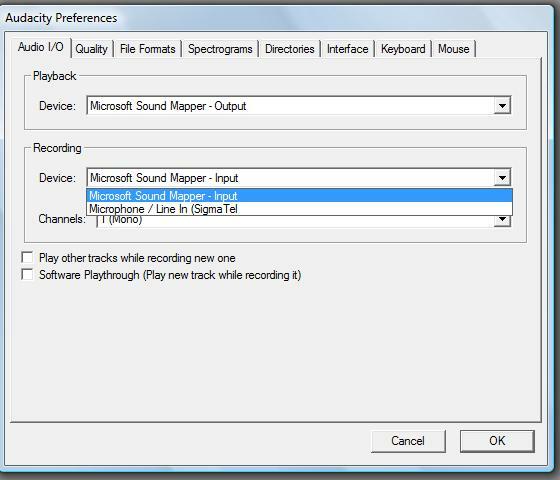 Do you see where I have it highlighted with “Microsoft Sound Mapper” under “Recording”? If your USB microphone is plugged in, you’ll see it listed there. Make sure it’s highlighted and click OK.
Do a quick test recording to make sure that you can hear yourself talking when you play the recording back. If it’s working, then you are ready to start recording your podcast. If you do a lot of editing into your podcast file, make sure that you save it often: I’ve run into plenty of problems with sound files I forgot to save frequently. Make adjustments to be sure you can be heard loud and clear. That will set you up to initally record your podcast. If you’re unfamiliar with Audacity, don’t worry – it’s fairly simple to use (you’ll see basic buttons like record, play, pause, etc.) and you’ll get the hang of it eventually. Now that you’ve got the technical work ready on the front end, let’s try and publish a “test” file to a .mp3 in order to make sure you’ve got this figured out. It’s best to test these files first to make sure you’re capable of getting it done; then you can rest easy once you start publishing new content. 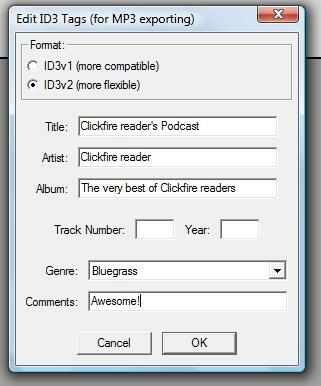 It’s not as easy as clicking “Save as -> Podcast” when you use Audacity, but that’s ok. I’ve got you covered. The goal in this section will be to teach you how to end up with an Mp3 file that is properly formatted and includes information like your podcast’s title and source. This way, when people download your podcast, their media player will display useful info about your podcast. Don’t ask me why I selected “Blues” as the podcast category – maybe it’s because I’ve got rhythm – but hey, at least it works. Anyone listening to my podcast on their computer will be able to see who published it. In order to accomplish this with Audacity, however, you’re going to have to execute a few “tricks” that I’ve picked up. First: Audacity, for some unknown reason, can’t export your file to an .mp3 unless you have a specific file handy. If you’ve been playing around and tried to do this yourself, you probably noticed that the program asks you for a “LAME MP3” encoder or something simple. When I first saw this, I thought “yes, ‘LAME’ is the right word,” but it’s actually a simple problem to solve. You’ll need to download a file known as lame_enc.dll, which you can find for free all across the information superhighway. Download that file to your desktop at first so it’s easy to find. Now, when you try to “File -> Export as MP3” you’ll be ready. Tell Audacity where your lame_enc.dll file is (on your desktop for now) and it will take care of the rest. Voila! Now you can export MP3 files. Second: Now that you can export MP3 files, it’s time to dress them up the way I did in the screenshot of one of my podcasts. Fill all the information to your desire – if you’re unsure about something (like “album”), you can leave it blank. But since this is a test file, try to fill them all to see how the end up looking when you play the podcast with a media player. As for the “format” on top, I tend to leave it alone. I haven’t really noticed any difference between the two types of file formats, to be honest. Now you’re capable of putting out a podcast-caliber .MP3 file, all by your lonesome. But what will you fill it with? Next, we’ll put content and publishing together and get you started on the path to podcast glory and honor. You actually need to record something now. In this part of the series, we’ll finally tackle the meat and potatoes of publishing a popular podcast: your content. Speak Up! How’s Your Voice? Yeah, you kinda do. We’re used to listening to ourselves through our own heads – with bones and flesh in the way of sound waves – and we’re actually hearing something different than what everyone else is getting. Hearing your recorded voice can be a little unnerving – you thought you were Barry White but you’re actually Gilbert Gottfried. After all of this work, you realize that the hardware in your throat isn’t as finely tuned as you thought it was. Try speaking from your chest, not your mouth. You access more powerful muscles when you concentrate on speaking “from” a lower area of your body. Project your voice confidently. An old college acquaintance who majored in theater once told me that a good way to do this is to concentrate on pushing the sound through your teeth. Don’t just speak loudly enough so you can hear it – speak like you have an audience in front of you but no microphone. Most of all, don’t procrastinate your podcasts just because you’re afraid how people might judge your voice. Now that we’ve covered a lot of the way you say your words, how about the words themselves? The podcast quickly becomes yesterday’s story. Who reads yesterday’s newspaper? Again, it’s up to you to decide what’s best. You could try one style or the other, or you can try one style mixed in with the other. If you do some preparing, get some notes ready, and still don’t think your podcast is interesting enough, there are a few ways you can add some value to them. Guest interviews. Try a program like Skype to record phone interviews or bring in your guest. You don’t have to land a huge name, simply try to find someone who might be able to offer something to your listeners. Incorporate music. As long as you can avoid using music illegally (always an issue with music), try to include it as much as possible. Include running gags. Take some cues from what works on radio: include some funny running gags and noises. For example, every time you mention someone’s name, you could include a funny audio clip of them flubbing a line. Introduce characters. If you can get a friend to sometimes join you and break up your monologue, try it out. Try a “how-to.” How-to’s can provide a lot of value to people, and sometimes people can hear more from your speaking voice than they can from an article. Don’t be afraid to get creative. As you publish more podcasts, you’ll probably grow more comfortable with your style, but make sure that you keep experimenting and trying to find new ways to be entertaining and provide value to your listeners. Make sure that you archive your podcasts on one page of your blog so that loyal listeners can find more material. So you wanna make a podcast? You’ve got no excuses to procrastinate now! Are there any credible ways to somehow monetize podcasting? I have thought about that a lot, especially as a factor in whether or not to try to produce a podcast of my own. My first thought would be to sell advertising spots directly. This post seems to cover the various options pretty well: http://www.thepodcaststudio.com/2008/06/09/podcast-seminar-monetizing-your-podcast/. You can also import your MP3 file into iTunes and do the ID3 tags there (which is how you can add album art to your episode). I have found that while a USB microphone is easy to connect, they don’t always work with every program (like webinars). I’ve also never been able to hear the “clarity” that is supposed to be more evident in a USB microphone. Keep up the good work. nice one! good little intro about the pod cast concept. this is something i would like to do fairly soon. its important to have an empty room for audibility, unless you know how to add some reverberation effects afterwards.